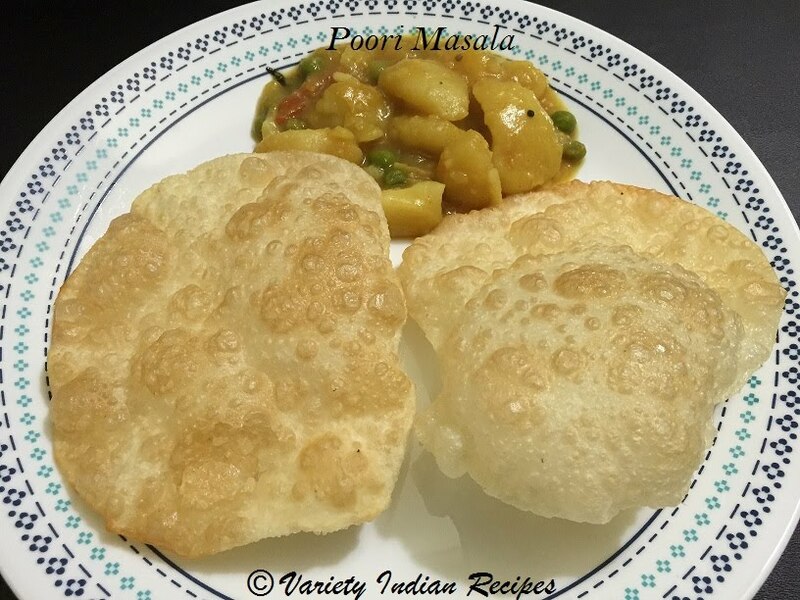 Poori is a deep fried Indian bread. It is a very popular recipe loved by all. It tastes great when served with potato masala or channa masala. Soak Rava in 1/4 cup of water for 15 minutes. In a bowl take the flour (maida or wheat flour) , salt, rava and mix well. Add water little by little and make a smooth dough. Leave the dough for 15 minutes. Roll the balls to a circle using rolling pin. Make sure the rolled circle is not too thin nor too thick. Add the rolled circle one at a time into the oil and gently press them until they puff up. Flip to the other side, and once it turns golden brown drain the oil and remove them. Serve hot with Potato Green Peas Masala.